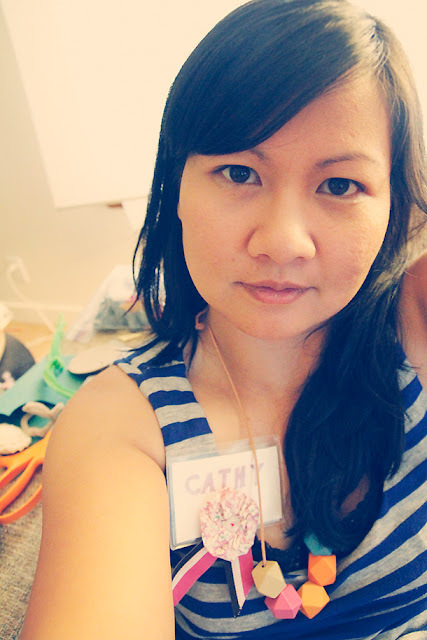 Catshy Crafts: I got schooled at School House Craft! I got schooled at School House Craft! One of the classroom at School House Craft. Love the framed blackboard and bulletin board. I am not the most outgoing person in the world. 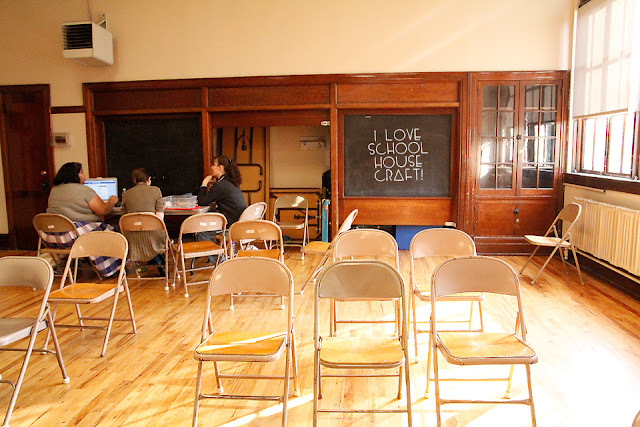 So when I first heard about School House Craft last year at Urban Craft Uprising, I immediately loved the idea of it. Learning all about opening and running an indie craft business? Organized by Andrea Porter, wife of Matthew Porter, whose work I'm a big fan of (and have several pieces)?! Being around other crafters? 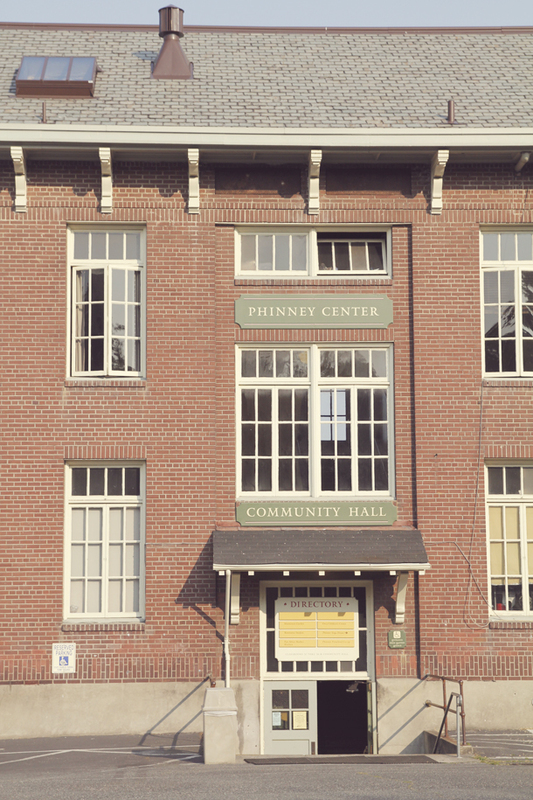 The conference was even being held in an old brick and mortar school. Sounded awesome! But actually going was a different story. So I let it pass me by. My Etsy shop was barely off the ground at the time, I told myself. It's too expensive. I won't know anyone. These excuses got the better of me. Catshy Crafts has been up and running for about a year. I've slowly increased in sales and views. I had a public viewing of my work. My work has been featured in a national magazine and a popular blog. May the crafts gods be ever in your favor. Even with my social anxiety, I was seriously considering attending ONE class from the conference. $30 for one class. In and out. And none of the dreaded small talk between classes or finding some one to eat with at lunch. One class I could handle. It was also a class I knew would come in handy come November (more on that in another post!). But just a few days before the conference was to start, I got word of Groupon deal - about 50% off tickets to.....Wait for it...... School House Craft. Way better than the early bird special. $45 for a one-day ticket. So, for just $15 more than I was going to pay for a single class, I could get the whole day of classes PLUS lunch and snacks. (And I even got $5 more off the deal because I had Groupon Bucks!). So, it was a done deal. I signed up for a full day of classes. During the days before the conference, I had a case of "first-day-of-school jitters". Luckily, I have a very supportive daughter who gave me some words of wisdom. You see, my daughter started a new school this year. She was worried about not knowing anyone at her new school and leaving her old ones behind. When I told her I was nervous about going to "my school", she said: That's how I felt when I was going to my new school! But don't worry, you'll make friends!" I loved that the conference took place in an actual school house! 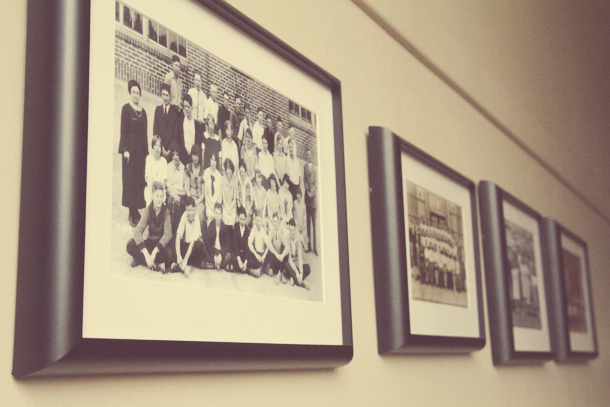 :) Photographs of previous classes lined the halls. I met super-nice folks like UC organizer, Kristen Rask and School House Craft organizer, Andrea Porter. I sat at the morning round table discussion with Stephen and Shauna. I chatted with sisters, Molly and Emily. I met Marlo (oops I called her Marla!). 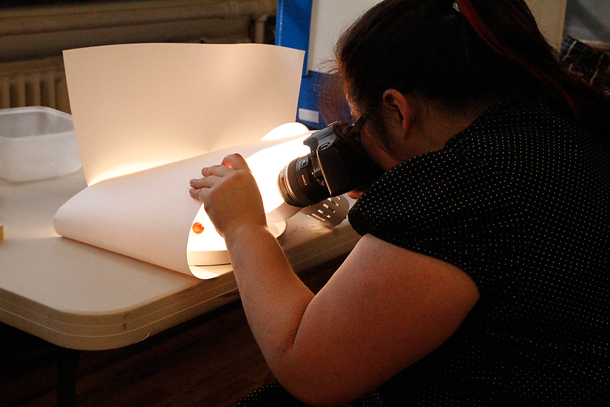 I even snagged a spot in her small object photography workshop at the last minute. I re-connected with a couple of people I had met before (at an EtsyRain meet-up), Amy (who also happened to be my daughter's art teacher last year) and Kelly, who was at the Joy Guild booth where we made our own name tags. I made a fabric yo-yo for my name tag :) The necklace is by BlueBird Lab. I also managed to overcome my fear of small talk and introduce myself to people. Asked a few questions. Suggested topic of a morning round table ("good booth displays at craft show"). Raised my hand in class. Exchanged business cards. Got some amazing feedback on my shop. 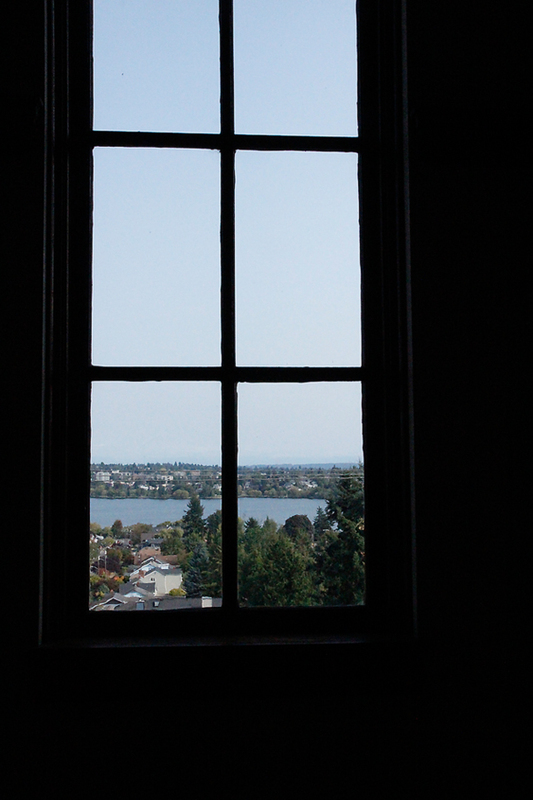 View from the 3rd floor of the Phinney Neighborhood Center. I also learned so much from the talks I attended. My first class was "Craft Show Vending - A to Z" with Kristin Rask and Moxie. (They posted a PDF of their talk here.) Not only did I get a run-down on craft shows, but I got excited (and slightly freaked out) about participating in my very first craft show in November. One particular nugget of wisdom that hit close to home was from Moxie. When they were talking about the reasons for doing a craft show (it's not all about the money), she shared that she herself is an introvert. And even though the experience is exhausting and tiring and draining, it was worth it at the end of the day. For the contacts made, the relationships formed, the experience of being with other crafty people. And yes, that is how I felt about going to School House Craft! What a big step this was for me. Not just going to the conference and confronting my fears (which of course was huge for me - I am an extreme introvert!). But taking a step towards meeting "my people". The crafty folks who love to make things, and obsess over their photos and item descriptions, who get elated when a sale comes in. Or when they get a new Facebook Fan. And above all, love handmade. One of the classrooms of School House Craft. Love the hardwood floors, built-in cabinets and blackboard. That was the name of the next class taught by Emira Mears, author of blog and book The Boss of You. She talked about the reasons why we need to share our successes with our friends and family and community at large. To celebrate every milestone so that we can see how far we've come. It may feel like we're tooting our own horn, but it is actually something we need to do more of. She even gave us the opportunity to do so in class. Taking her words to heart, I shared some of my own good news with the class. (re: my recent publication). It did feel good to a) contribute to the conversation b) get some slaps on the back for my accomplishment. 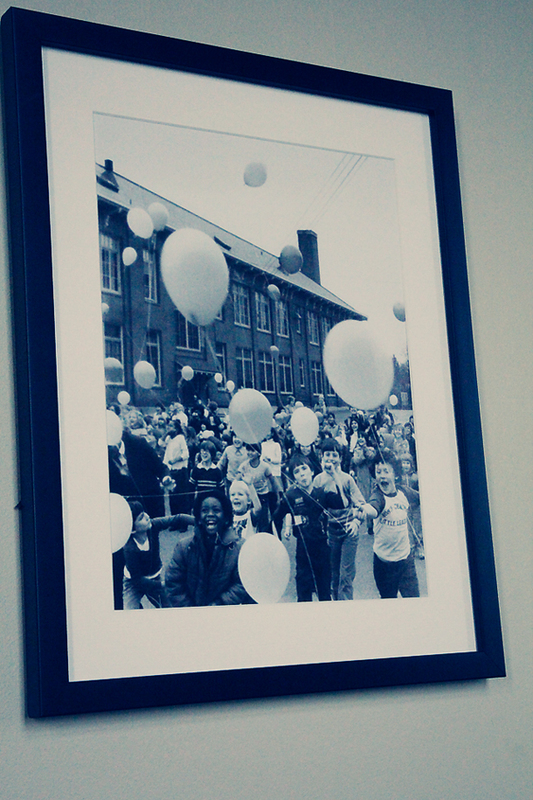 One of the many photos hanging in the halls. Looks like balloon day at the school house! For the next session, I was going to see Stephen and Shauna's talk on collaborating (because I would love to collaborate with other blogs and shops in the future! ), but at the last minute decided to ask Marlo if she had a free spot in her small object photography workshop. I was kinda craving a more intimate session and one-on-one feedback on my shop. But I still learned some useful tips and techniques for photographing smaller object like jewelry and pieces with reflective surfaces. And got to chat more with my friend, Amy. Marlo demonstrating how to photograph small objects. After this class was over, I grabbed some of the after-school snacks (s'mores cookies and Theo's chocolates) and headed home to my family. It was quite a day! 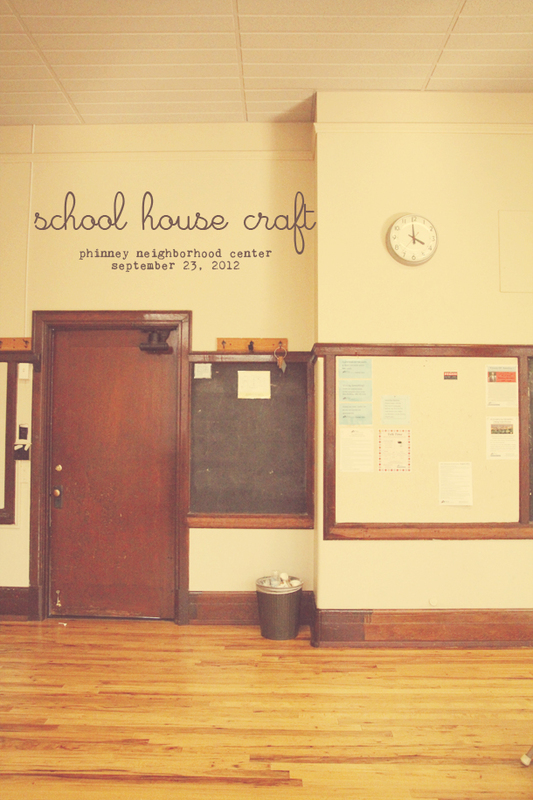 Knowing that there are great resources out there for Etsy-preneurs and creatives like School House Craft is amazing! I just have to give myself that push to get out the door to connect with people in person. Maybe a Crafty Meet-up here or an Art Opening there. And definitely the next School House Craft! This was an amazing article to read - so inspirational as to why we put together School House Craft. As one of the organizers your story made me remember why I want to do this event every year! Thanks Marlo! See you soon at the EtsyRAIN holiday show! Wow! Thanks for your kind words!